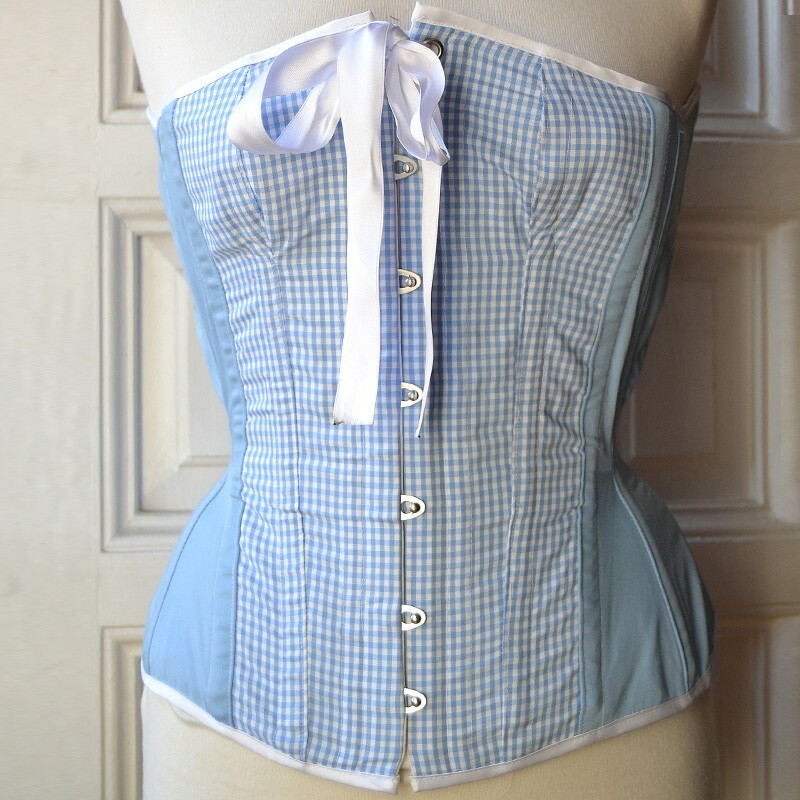 Pin-up inspired blue gingham overbust corset. Fully lined, steel boned and reinforced. Features front busk fastening with white satin bow, white toppings and back lacing with protection panel. Attention! This sample item has been made according to specific measurements indicated in product details. The naive sexiness of the pin-up style transformed into a design. That is the blue gingham overbust corset. Fully lined with soft yet stretchy cotton, it is reinforced and steel boned in order to get the perfect shape and sturdiness. It is opened by front busk fastening with white satin ribbon that keeps neckline closed and also decorates it. Its back is high but hip lenght is only medium in order to be very comfortable. Features white toppings, white back lacing and detachable modesty panel. This is a sample corset. It has been made for the catalog according to the measurements specified in product details. It is suitable for you if your measurements and bra cup fit into the ranges indicated in the drop-down menus. We are preserving the corset with care at our atelier until you make it yours. If you have any question about the design, contact us before shopping, we will be more than happy to help you.